The large ones are the subject of this chapter as it has a function in our life, at least the way I see it. Here’s what I mean. For all of you that are not experienced snowman makers, big snowmen are first of all small snowballs. Just like children, with a little nurturing they become big snowballs or grown adults; then if we choose snowmen. Yes, little snowballs can become snowmen. So how do we make snowmen? First make a small ball then roll it in the snow, keep rolling and soon you have a big ball. Add a medium sized ball then a smaller one for the head, add a few bits of charcoal and a carrot for a nose and we’ve got a snowman. Okay, how does that relate to me? Think about it. When our belief is that we are doing everything possible, can we do one thing more? It is amazing how momentum makes a difference. Just get the ball rolling and pretty soon there’s a new snowman. Often it’s just one more thing we do that gets the momentum rolling. Even a small, insignificant change can result in profound consequences, sometimes without a logical explanation. Here is an example. When Sandy Koufax came up to the Brooklyn Dodgers, he had a devastating curveball and an electric fastball. He had only one problem, he couldn’t get that fastball over the plate and he lingered as a so so pitcher with great stuff. Finally, after a number of mediocre years a small insignificant change was made. His frustrated pitching coach with the Dodgers suggested that Sandy ease up a bit on his fastball. The consequence was that immediately his pitch control improved. Almost at once he became the most dominant pitcher in the Majors and ended up a Hall of Fame pitcher in his first year of eligibility and one of the greatest pitchers in baseball history. It wasn’t a miracle, just a small insignificant change along with a lot of God-given talent that made the difference. Sorry, I don’t know who wrote this little gem but it always seems to work for me. Hope it works for you. Here’s one more little tidbit, it involves “miracles.” Miracles happen when they are most needed and the person involved has the faith and hope to believe they can occur. Sometimes when it’s almost to the point of hopelessness a miracle occurs. That’s why they call it a miracle. It may be a small miracle or a large miracle. Sometimes we don’t even recognize it as a miracle, just maybe our good luck, a result of our hard work, a fortunate event, even a coincidence that can change our lives and get us back on track. Moral, don’t give up hope, keep the faith, and make that significant or insignificant change. Don’t rely on miracles, just make use of your God given talent, institute changes when necessary and live your miracle! Loyalty, fuzzy word by any account! There are just so many factors to consider. Loyalty generally applies to our family, spouse, friends, country, school and so forth. Defining the word itself is almost as elusive as defining the word love. Technically Webster defines loyalty as “being faithful to something like a person, or cause.” After all, while we may consider ourselves as being a loyal and true person – are we really? Or, are we just putting on a show when it’s convenient. After all, how loyal do we have to be to be considered loyal? You will have to answer this question yourself. However, today I will be discussing loyalty from a different context. That is, loyalty to the company or organization that pays us. Yes, enables us to live a decent life outside of work, pay our bills-even enjoy “the good life” to some extent. Are we supposed to go to the wall, just because they pay us? Are we supposed to be considered disloyal if we hate our job or hate our boss, are underpaid and under appreciated? What if we have ideas that can help improve a situation and our ideas are ignored – and what if we tell others how much we hate – are we still loyal? How do we define loyalty under these circumstances? How do we maintain a positive mental attitude? If you were ever in the military you know that a soldier that isn’t complaining is an unhappy soldier. Complaining is part of human nature – so, don’t feel it is unusual. In my experience the people that complain are usually the ones that care. On the other hand, out of control they can also be a cancer to an organization. Negative attitudes create all sorts of problems and must be dealt with. Avoid negative attitudes. Attitude is the key issue; motivation is paramount and integral in not only doing a great job but enjoyment and a feeling of fulfillment. Underpaid – probably one of the biggest casualties of the economic times. With not many increases being given in recent times, it again is not unusual to not see a raise. I always say that the squeaky wheel gets the oil. One good approach to take is to evaluate the additional duties that have been given to you since your last review – ask for a meeting with your supervisor and come prepared. See what they have to say and don’t expect immediate gratification. They may have to work on it. It may be that because we are capable and willing- we still have a job. Hate your job? First thing you can do is ask yourself how much do you really hate it? Why? Next check your long term goals to determine if this position will help you get to where you want to be. Determine how long it will take. Then ask do I really have a chance to get there. Oh, you don’t have any goals? Suggestion- make some! Might want to keep in mind that to get to the next position you must do a great job at this one, even if you hate it. Also, keep your resume up to date, work on your networking and value what you have now. One final thought – often if we have been with a company for a time we can begin to take what we have for granted, we begin to think the grass is greener someplace else. If from time to time you test the market (go out on an interview) – sometime we find yes, the grass is greener – sometimes not! Is it time to quit? Think about it- what will happen, what will improve? Will I be able to find what I’m looking for in a short time- is the job market open for me? How can I achieve my long term goals by quitting? Generally I suggest not quitting until you have something else lined up that can help you achieve your long term goals. Today most people that are being hired are people that are already employed. Might want to keep these things in mind. A great colleague of mine and a co-author of the book Adapt or Perish, Emily Woodman-Nance talks about “the company of me.” She considers herself a trouble maker, and I agree- she is! Why is she and why do I agree that she is? Well it’s simple, she takes nothing for granted and makes you prove the point. If you can’t prove and justify your point of contention- you haven’t thought it through. Thinking through the who, how, why, etc- makes for good decisions. They are not always right but, shows how loyalty is a matter of doing the right thing with the right preparation. Doing what you are told to do is okay but, finding ways to improve the system is priceless. The morale is asking questions is not being a disloyal person, just a dedicated loyal person. Being a loyal employee requires something called “hard bark.” That is being both fair and tough minded. “Hard bark” came from the Paul Newman 1967 movie “Hombre” and really means someone that is tough in his thinking and has perseverance to go with it. Often times working for a company – especially over the long haul and through good and bad times takes some “hard bark” – I’m confident you can find some of that. Loyalty surely is a fuzzy word! One of the most frequent things I hear from people after they get a new job is, “I’m glad I don’t have to do that anymore.” For most people that are relatively reticent in nature this seems to be a daunting task. Daunting in the fact that they are told by consultants that this function is something they will have to do in the job hunting process. I agree with this in that most people are not accustomed to selling their virtues to those that they do not know. On the other hand most people have a circle of friends, acquaintances or work related people that they met someplace or other. Why not just expand this circle. Networking is really a way of life and something just about anyone can do (unless they are a total hermit). That is, if they learn how to do it, then it can be fun and easy and a great way to expand our horizons. Keep in mind that you need not expect to get a whole lot of help from anyone if you have not been helpful in the past. If you have been of this persuasion in the past, start to work on it now. Also keep in mind that it does not stop when you seemingly do not need help from anyone. From time to time we all need help. Do it all of the time. Just make it a point to learn about somebody when you meet them. Simple questions like where are you from? What do you do? and the like are good “icebreakers.” Find out their areas of expertise, this may come in handy later on. Hint: most people like to talk about themselves. Make it a point to get to know others in your industry or company. Get their card and make notes on it. This will help you later on to identify them and help you remember important things about them. Good places to meet industry people are at conventions, symposiums, classes, volunteer events, charitable events, golf courses, bowling alleys and the like. Be sure to offer your help when needed and clear it with them for you to call from time to time. Often a follow up call to say you enjoyed meeting them and a how is it going even a “let’s do lunch.” Be sure to not discriminate whether or not they are above or below you in stature. Life long associations can result from this simple activity. Keep a record in a file on your Ipad, phone or computer listing where and when you met and other pertinent data. The old fashioned way is a 3×5 card and it still works well today. Take calls from Head Hunters and give them recommendations. They will remember this. They won’t be helpful if you just fluff them off when they need help. It’s almost like getting to know your banker before you need money! Practice makes perfect. The more you do it, the better you will get at it. These are just a few thoughts. There are many books on the subject. So start early and work it all the time. The book Adapt or Perish has many suggestions on this subject. Unfortunately, you can’t control what others do. However, you can control what you do, how you think and what you feel. As a professional who effectively manages projects, programs and other staff, you need to remember to use these same skills when tackling any career change or goal. In search, you can’t always control whether you get hired, however you can control how you manage yourself, the number of hours you invest each week and productivity. You need to respect yourself enough so that your self-confidence remains intact whether you succeed or fail. If you do not take enough risks, you may also be losing out on many missed opportunities. Think them through, get a coach and take the plunge. If some things go wrong, learn from them. I came across this interesting story some time ago: One day a farmer’s donkey fell down a well. The animal cried piteously for hours as the farmer tried to figure out what to do. Finally he decided the animal was old and the well needed to be covered up anyway, it just wasn’t worth it to retrieve the donkey. He invited all his neighbors to come over and help him. They all grabbed a shovel and begin to shovel dirt into the well. At first, the donkey realized what was happening and cried horribly. Then, to everyone’s amazement he quieted down. A few shovel loads later, the farmer finally looked down the well and was astonished at what he saw. With every shovel of dirt that fell on his back, the donkey was doing something amazing. He’d shake it off and take a step up. As the farmer’s neighbors continued to shovel dirt on top of the animal, he would shake it off and take another step up. Pretty soon, everyone was amazed as the donkey stepped up over the edge of the well and trotted off! Life is going to shovel dirt on you, all kinds of dirt. Anyone can make a mountain out of a molehill, however that’s ‘their limited’ reality. Do you want to allow them to make limited decisions for you? The trick is to not to get bogged down by it. Consider making better decisions for yourself! You can get out of the deepest wells by stepping up on your personal mountain! Shake it off, adapt, and take a step up to your current and future success. Maintain your vision, keep your eyes on the goal and take the necessary leadership action to achieve your desired results! We’ve talked a lot on this blog about how you as an individual and as a business need to adapt to the changing circumstances in the job market. You have to be better, more informed and more innovative to land a job, particularly at the higher levels. Virtually everyone agrees that “good enough” is no longer good enough to get noticed today. You must be the best or you will never be considered for that job. This means that everything your potential employer sees from you or about you must be quality. If you write a blog post, make it clean and grammatical. if you post on LinkedIn, make your posts the best. If you answer a question, make it the best and most carefully reasoned answer you can make. Too many times we take the easy way out. On a medium as public as the Internet, where every potential employer will see what you say and do, make everything the best and you will be well on your way to success in this job market. Boy isn’t that a tough one? Somewhere down the road I must have known but to tell the truth- I have no clue. Does it indicate how good of a person we are? – I think not. Does it tell how much common sense we have? Probably not. Does it tell how good of a decision maker we are? How can it- it hasn’t experienced the results of any of our decisions. Does it tell our level of motivation and attitude, how we react to bad times, stressful situations, our diligence, moral equivalency, or social skills? I don’t think so. As kids much is made of our so called IQ’s- this is nice when we are going to school but not so important after we have been out in the real world for some time. History is replete with examples of high achievers that were not known for their extraordinary brilliance. Some include, General and President U.S. Grant, Ronald Reagan and Abraham Lincoln. I can go on and illustrate great industrialists, but I think you get the point. What I’m getting at is that it isn’t what you’ve got but, but what you do with what you’ve got. Believe Thomas Jefferson or Benjamin Franklin said something like that. It’s as true today as it was then. For prospective employers my suggestion is to find not only the IQ talent but look for the candidates that have demonstrated the ability to get things done and have the attributes listed above. If you have to make a choice- attitude and motivation are first- brains are second. Having both is priceless. Read my chapter on interviewing for more specific information on the selection process. For candidates – bone up on what you have done to benefit the companies you have been with- think about the things that have made money, saved money and saved time. If motivation and attitude have been an issue with you in the past- start working on them now. Also think about the skills you have acquired over the years. For the less experienced set or recent grads- I suggest you keep these thoughts in mind. You can also read my chapter on the seven step interview process as well as the chapter on the strengths of a person and a company. 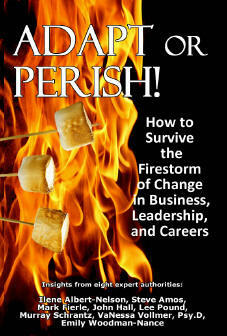 The book Adapt or Perish will be out shortly. Have you ever been around someone that perpetually seems to have an attitude? I guess we all have at one time or another. Just seems they are always angry or complaining or whatever. Very seldom do they have a good word to say about anything, unless it’s about them. When we talk about our careers in my estimation attitude and motivation go together. Along this line negative is the key word. I’ll give you an example and ask a question. First there was Norman Vincent Peale who a number of years ago wrote a book entitled The Power of Positive Thinking. It is still a best seller today after 50+ years. Dr. Peale made millions with this concept. 1) Work on it all the time. 2) Hang around people with positive attitudes both at work and outside work. They are usually the happy motivated people, if you get what I mean. While we can’t choose our family or sometimes our bosses, we can choose who we hang with. 3) Achievers are driven and cannot afford to be around negative thinkers. Real leaders motivate others with a positive attitude. 4) Negative attitudes create anger and depression. It’s hard enough out there, we don’t need that. 5) Finally attitude and motivation are first in order of importance, brains are secondary. Think about it. One of my chapters in the book Adapt or Perish is about “strengths of a company or person.” Much time is spent on this issue of attitude hope you take some time to read it. Wow, I usually say, what didn’t I do wrong? That’s usually the start of it, especially in today’s world, when we are going out on interviews and coming up with no meaningful job offers. What could be the reason I didn’t get an interview, didn’t get a second interview or an offer. This might be true even if we are the best qualified, etc, etc. Here are a few ideas on the subject, starting off with the fact that maybe you did nothing wrong, just didn’t get selected. Others change of job specs in mid-stream, jobs go on hold, President’s girlfriend gets the job, and many other factors you have no control over. Here’s the difference: with opportunities somewhat limited in recent times there are a whole bunch of professional interview types out there. They do the right things, dress appropriately, say the right things and so forth. That doesn’t make them more qualified than you, they just know how to work the system. What can you do to improve the odds? First of all read the soon to be published book Adapt or Perish. This will give insights into how you can differentiate and set yourself apart from the competition. By the way this is a whole lot different than working the system! It is what I call “being prepared” by knowing the product you are selling (you) – a good salesman’s #1 rule. Arrive on time or a few minutes early. An old analogy goes something like 80% of success is showing up! Look people in the eye when answering questions. Avoiding eye contact generally means you are lying or making something up! Be able to describe what you have done, not what you think you can do. People get hired and paid for what they have done not what they think they can do. Be sure you get correct spelling, titles and pronunciation of names. “Ole what’s his name” doesn’t work. You’ve got lots of competition out there. Then send a thank you letter, not e-mail. Based on questions you ask, like “how can I help you?”, develop a plan of what you would do- and ask for a second interview to discuss. To really be prepared develop more than one scenario. A good lead in: I’ve got some ideas to discuss with you. Make sure your discussion is a dialogue not a monologue. These are just a few ideas. Most are time tested but often forgotten in the heat of the battle. Using these strategies will help you keep from wondering why and may even help get you that position!